From somewhere in the ether, the voice of a radio DJ (Alessio Rigo de Righi) introduces Schumanns Symphony No. 1 in Italian. Peering down on Buenos Aires from a rooftop, the camera slowly pans to frame a courtyard where a soccer match is just underway. From our position above the city, we watch what at first seems like a normal match but soon becomes something a little stranger. The rules change midway, leaving the goalie, Lorena (Laura Paredes), alone against the opposing team, who chase her out of the courtyard and into the streets, beyond the cameras gaze. From there, she entersby chance? a theater, where a rehearsal for Loves Labours Lost is underway, and new games of the romantic variety begin. 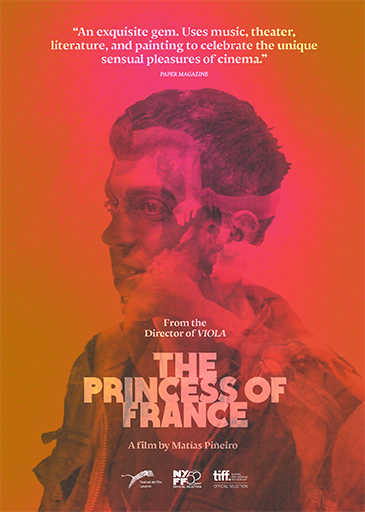 Matías Piñeiros The Princess of France is about more than one form of playboth in front of and behind the cameraand this short prologue is just the first hint. Its cast of characters, with all their sportive liaisons and romantic machinations, form a circuitous network of boyfriends and girlfriends and lovers and exes, but the film holds plenty of tricks up its sleeve as well. Just as Lorena enters the scene in medias res, we too seem to arrive perpetually in the midst of things, only to watch as they unfold, repeat, and double back. And these games take us, like Lorena, into and out of the theater. The cinema has always held the theater at a curious distance: sometimes invoked with a note of disapprovalone can refer disapprovingly to a movies excessive staginess, or disparage it as a work of mere filmed theaterbut at other times set aside as a privileged space between the real and the imaginary. In Bergmans Fanny and Alexander (1982), the theater serves as a little world, a shelter from the chaos and cruelty of the bigger one outside. But if Bergman finds in his little world a certain measure of control, Piñeiros films find perhaps the opposite: something much more generative, reactive, and even a little beyond the filmmakers control. There, the theater is less a shelter than a way of being: as As You Like Its Jaques has it, all the worlds a stage, and the theaters sense of play and imagination is somehow everywhere at once, remade constantly in the streets and bedrooms and museums and courtyards and recording studios of Buenos Aires. In Piñeiros last two films, this has been most readily suggested by the enlisting of Shakespearean comedies as intertexts: As You Like It in Rosalinda (2010), and Twelfth Night in Viola (2012). For The Princess of France, the play in question is Loves Labours Lost, and its a curious one, too. At once linguistically dense and narratively thin, this is a work of theater that seems unusually preoccupied with its status as a work of theater, with characters who enact not one but two masquerades of their own, alongside all of the usual Shakespearean dissembling and double-crossing. Of course, as usual, Piñeiros film does not so much adapt the play as metabolize it, diffusing its efflorescence of romantic verbiage and themes of thwarted male desire among the characters here in ways that scramble the already complex female-male volleying of Shakespeares plays. Víctor (Julián Larquier), an actor who leads this troupe of players and seems to date most of them, might correspond to one of the plays many flighty, overzealous suitors, or he might well be the aloof and unapproachable Princess of France herselfa role he once played, before passing it along to his friend, Guillermo (Pablo Sigal), who may or may not be secretly dating Víctors girlfriend Paula (Agustina Muñoz). All becomes a bit more complicated when, suddenly returned from a year in Mexico, Víctor tries to reconvene his troupe of collaboratorsfriends and girlfriends and lovers and exes aliketo record the play for radio. These rehearsals and recording sessions form a kind of overtone to the drama, as dialogues repeat and recirculate, sometimes aligning, sometimes not, with the characters own wayward impulses. In this way, the small mysteries and deceptions of sound recording are given particular emphasis here, as radio, sound effects, and voiceover narration each suggest little parallel universes alongside the films action. Sound recording also offers the chance for loops and repetitions, and there are many instances of these in the text of Loves Labours Lost already, as there are in all of Piñeiros Shakespeare films: characters repeat lines or echo one another or are trapped in little circular patterns like broken records. Here, these little repetitions can function as a kind of penance, or offer a sour memory the opportunity for a do-over, or even realize different possibilities for the direction of the story. In these films, rehearsal is not just a means to an end, but a way of living, its patterns of recurrence extending into everyday actions: like the montagealmost a supercutof two lovers kissing, or the three variations on one scene, each with very different sets of results. All of this helps to enlist the audience not as passive observers, but as willing participants, team players. Piñeiro has said that he likes to think of the spectator as an accomplice, one who helps put together and rearrange the many parallel lines of his films, and this sense of conspiracy seems to account for the unique pleasures of watching his work. Indeed, this collusion extends throughout the films, enveloping Piñeiros regular coterie of onscreen players, and even guiding the deceptively insouciant camera of regular cinematographer Fernando Lockett, who is able to harness whole lengthy scenes in languorous, panning single-takes. Even with all its asynchronies and misalignments, its subtle feints and dodges, theres always a reassuring sense in Piñeiros films that all will be right againthat, as in all of Shakespeares comedies, the balance will be righted. Leo Goldsmith is a writer and curator based in New York. He is the co-editor of the film section of The Brooklyn Rail, and a PhD Candidate in the Department of Cinema Studies at New York University.